Let the short ribs sit at room temperature for 10 minutes. Season generously with salt on all sides. Heat a large, heavy-bottom pot (or Dutch oven) over medium heat. Add enough oil to coat the bottom. Work in batches to sear the short ribs on all sides (you don’t want to overcrowd the pot). Transfer the seared short ribs to a plate. Add the red onions to the pot. Sauté for about 6 minutes until tender and slightly caramelized. Stir in the garlic and cook for another minute. Stir in the smoked paprika, mustard powder, and cayenne pepper. Add the short ribs back to the pot. Pour in the beef stock. Bring the stock to a simmer. Cover the pot, leaving an open crack on one side, and reduce the heat to low. Simmer for 2 hours. Remove the lid and continue to simmer for 30-45 more minutes, or until the short ribs are falling off the bone and fork tender. Meanwhile, add enough oil to a large sauté pan to come ½” up the sides. Heat over medium-low heat. Cut the tortillas in quarters. Once the oil is hot, work in batches to fry the tortillas on both sides until golden brown. Transfer the tortillas to a sheet pan lined with paper towels. Immediately sprinkle with salt. Once the short ribs are finished cooking, preheat the oven to 425°F. Remove the short ribs from the pot and gently shred with a fork. 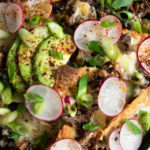 Assemble the nachos by layering the tortillas, short ribs, and cheese in a large cast-iron skillet. Finish with a layer of cheese on top. Bake the nachos for about 5 minutes until the cheese is fully melted. Garnish the nachos with the green onions, shaved radishes, sliced avocado, a sprinkle of aleppo pepper, and a generous squeeze of lime juice. Serve with more garnishes on the side.